Unlike most military aircraft developments, the F4H was a company-funded development that initially did little to interest the US Navy. Nevertheless, the Navy started warming to the idea of a powerful carrier-based all-weather interceptor. First flown in May 1958, the prototype displayed impressive performance with the help of its twin afterburning J79 engines. The Phantom II was born. Developed as the guided missile interceptor, the F4H, re-designated as the F-4 in 1963, featured a powerful intercept radar, a two-man crew, and up to eight guided missiles. This aircraft was supposed to make the air-to-air gun obsolete. That didn't happen, but that's another story. Typical loadout for the aircraft was four IR-guided AIM-9 Sidewinders on the inboard stations, four radar-guided AIM-7 Sparrow missiles in semi-recessed bays under the fuselage, and three external fuel tanks, two on the outboard stations and one centerline. The Navy operated a limited number of F-4As for a brief time while their preferred initial configuration, the F-4B was under production. Combat experience with the F-4B and advancements in avionics and engine technology led to the next USN version - the F-4J. The F-4J featured the new AWG-10 radar, the J79-GE-10 engines, slatted tail surfaces and drooped ailerons. When the next Navy fighter was cancelled (F-111B) and its follow-on was experiencing some delays (F-14), the Navy performed service life updates to its Phantom fleet with the F-4B and F-4J receiving avionics upgrades and airframe life extensions. The upgraded F-4B would be designated as F-4N while the updated F-4J would be designated F-4S. The kit is molded in Multi-Colored Plastic (MCP) as indicated on the box. The intent was to mold the kit with enough color separation as to allow the younger or less-experienced modeler build this kit without painting and have a reasonable Navy color scheme. Of course many modelers (including this one) will prime the airframe and repaint accordingly.The kit is molded in gray styrene and presented on three parts trees, in white styrene and presented on eight parts trees (two duplicate weapons trees are not shown), in black styrene and presented on three parts trees plus two separate parts, and one tree in clear styrene. In all, there are 15 parts trees in this box (plus the two separate black parts). It would have been nice to have the options needed to pose the model as depicted in the box art which would mean positionable leading and trailing edge flaps as well as the extended nose gear strut option. After all, the afterburner nozzles are already set for maximum power. The decal sheet not only provides the color CAG markings for this aircraft, it features a very thorough set of maintenance stenciling for the airframe and a nice set of stencils and markings for the weapons as well. Nice! You can see from the weapons that there are a variety of USN, USMC, and USAF variants in our future. As I said in the beginning, I was skeptical that Academy could unseat Hasegawa as best F-4 kit maker in 1/48 scale but I am convinced. The proof will be in a quick-build soon to see if this kit goes together as nicely as it looks in the box. Stay tuned. Aside from the colored plastic which isn't a plus for my tastes and the wide open nozzles, Academy has done a great job of putting everything in this box that we've had to seek from the aftermarket world to fix in the Hasegawa kits such as intake ducts and external stores. Overall, I think we have a winner here! 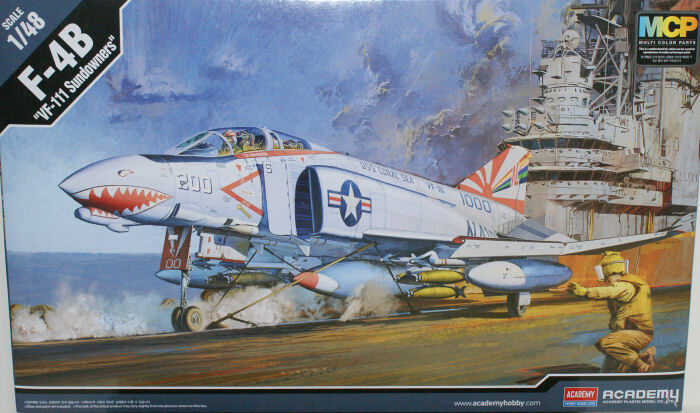 I'm assuming that Academy will be using the same designs to render the F-4 in 1/72 scale, so it is a safe bet that they'll dominate that scale as well. For a look at this kit build-up, take a look at our quick-build review. This kit is definitely recommended! My sincere thanks to Model Rectifier Corporation for this review sample!